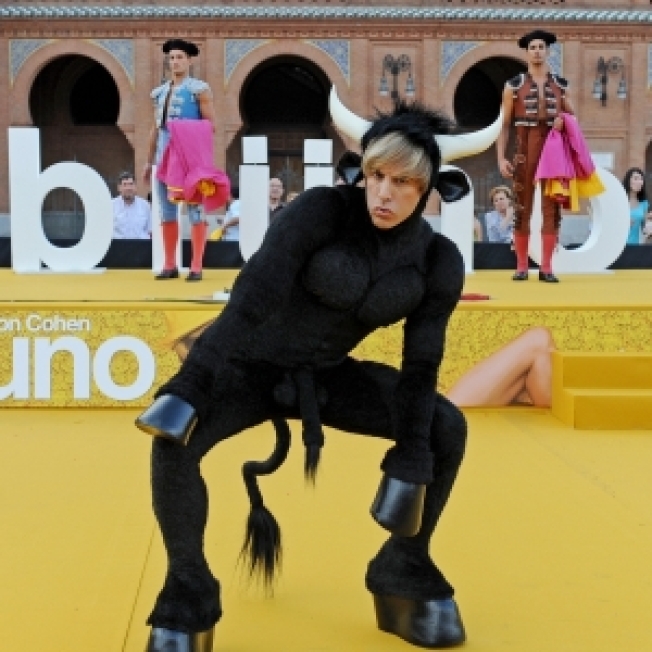 Actor Sacha Baron Cohen's latest movie character, an Austrian fashionista called Bruno, drew gasps and some cheers as he appeared dressed as a bull in front of Spain's main bullring Thursday. The British actor-comedian who was in Madrid to promote his new movie — "Bruno" — arrived in a horse-drawn carriage escorted by muscular matadors just as the sun set on the historic bullring Las Ventas. "Ich have come to redress the wrong done to the gay community by that Hollywood movie on Harvey Milk which was acted by Sean Penn, who's not even gay," Baron Cohen told a crowd of bemused Madrid onlookers in a German accent. Baron Cohen's 2006 movie, "Borat: Cultural Learnings of America for Make Benefit Glorious Nation of Kazakhstan," was a surprise box-office hit. His new film, which is scheduled for release July 10,features a flamboyantly gay character whose outrageous wit outstrips that of Borat. Sporting large hooves and a well-endowed furry black bull costume, Bruno strutted on a sand-colored carpet and invited "all cute bullfighters" to his hotel room for a party. Baron Cohen staged an elaborate prank at the recent MTV Movie Awards. In character as Bruno, he descended from the ceiling on a wire and, in a fake mishap, ended with his bare hindquarters in rapper Eminem's face. Eminem stormed off in a huff, but later said he was in on the joke. The July edition of GQ magazine featured a fully naked Bruno on the cover, outdoing Jennifer Aniston who wore a necktie only for the January issue.